SNOBAR started in 1991. Since then, they have developed various styles of snow rail / fence systems using galvanized square bar. 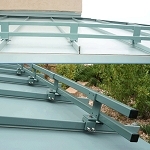 (Their systems can be powder coated to color match the roof.) 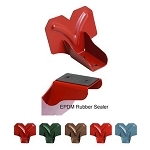 Their clamps and brackets are used to attach snow retentions systems for standing seam metal roofs and for exposed fastened panels. Their products include: SnoBar, ColorBar, ColorBracket, RoofClamps, and finally Ice Stoppers. Call us for a quote on any of their snow retention systems.